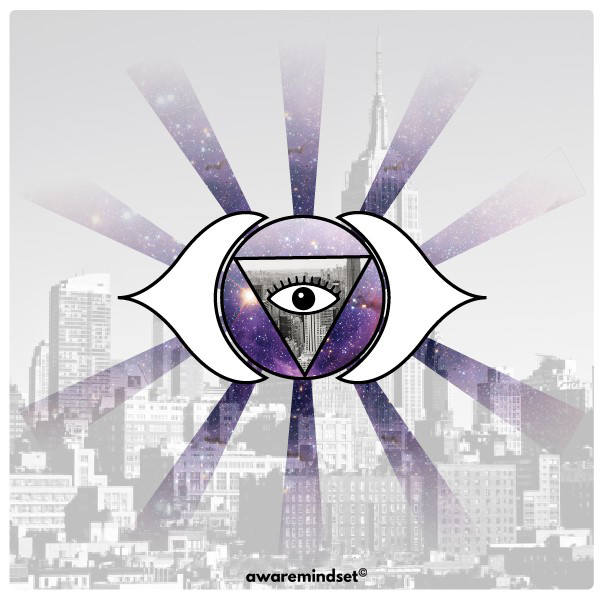 The third eye, inner eye or the sixth sense, also called as the “seat of soul” is an esoteric concept which offers perception beyond the ordinary sight. It is the bridge that connects the physical and spiritual world and opens access to higher realm of consciousness. In order to attain enlightenment, it is essential to meditate on the third eye with dedication. Lord Shiva is widely known for his third eye powers. In Modern Science, Third eye is called as Pineal Gland, located in the middle of the brain between the left hemisphere and right hemisphere. The deep location of the gland into the brain signifies its importance. The small, rice-grain sized organ is an endocrine gland which produces melatonin and serotonin. Melatonin is sleep inducing hormone and is responsible for wake-sleep patterns and seasonal functions of our body whereas Serotonin influences levels of happiness in our lives. The pineal gland consists of photo-receptive cells, same as our external pair of eyes. These cells receive light energy and convert it to signals for the brain to understand. Our external eyes can read the visible light spectrum which is only 2.3% of the whole Electromagnetic spectrum. We can only wonder the range of photosensitive cells of pineal gland or the third eye. . The pineal gland is also found in animals and birds and functions as master clock for proper functioning of the body. According to Hindu Tradition, Third eye is mentioned in Yoga-Kundalini Upanishad among the 108 Upanishads. In this Upanishad, the importance of chakra system in our body is illustrated. The seven major Chakras or energy centers are related to specific glands of our body. Ajna Chakra, sixth chakra is related to the pineal gland or third eye. The seed manta of “AUM” is associated with this chakra and its role is to grow awareness and spiritual insight in the believer. In Buddhism and Chinese religious sects, disciples are trained to perfect this sixth sense. Benefits of Activating Third Eye. Every human being’s body has three eyes and the inner eye or third eye is the most powerful source of greater knowledge and wisdom. Also known as Sixth Sense, an open third eye will increase one’s power of intuition about oneself and surroundings. It will also grow one’s awareness and fuel personal growth towards success and satisfaction. Anyone willing to activate the third eye should spend time to gain knowledge and wisdom about this topic through relevant books and an experienced guru. Like any other skill, activating third eye needs sincere practice and experienced supervision. Modern Problems with Third Eye. The biggest complication in the third eye is Calcification. The pineal gland consists of crystals of Calcium, Oxygen and Hydrogen which reacts with fluorine in our blood to form solid compounds of Calcium Fluoride. The fluorine in our blood comes from toothpaste and drinking water. Over time; solid Calcium fluoride is deposited over the pineal gland in layers and decreases the efficiency of the gland. The hardening over the organ is not natural and should be reversed at the earliest. This is the reason why activating third eye in a child is easier than an adult. Avoid Fluoride: Use Non-Fluoride Toothpaste and water purifiers that eliminate fluoride and heavy metals from drinking water. Drinking alkaline water is also a healthy option. Meditation: Doing mediation after any form of exercise will purify the gland with practice and consistency. Practice Sun-Gazing: Taking in the Sun’s energy for 3-5 minutes when it is orange or setting/rising is tremendously beneficial for the pineal gland and its decalcification. The pineal gland is a crystal and reacts remarkably to Sun. Eat more Green Vegetables: The more alkaline food is, better it is for the pineal gland. Green vegetables are charged with sunlight and will help in decalcification. Maintain positive thoughts and emotions: A happy state of mind will help the pineal gland to maintain its balance. I humbly urge the readers to believe and learn by doing their some of the above methods. Please don’t expect anything soon and let the actions show results with time.